Imagine for a moment that you knew nothing about the Saints’ “bounty program” or the fact that players and coaches were providing monetary motivation to injure opponents. 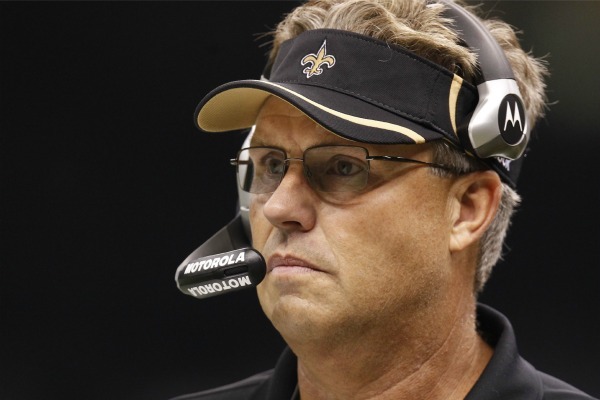 Does Gregg Williams’ locker room speech still sound horrifying to you? One of Kyle Williams’ brothers is a friend of mine so when Gregg Williams started talking about testing “little No. 10’s” concussion, I cringed. My heart dropped. The specific manner in which Williams was discussing the Niners’ players and their injuries was downright disturbing. “We want him running sideways,” and “We want his head sideways” are hardly shocking statements either when you keep it in the context of a football coach telling his football players to make sure the opposing running back runs east and west instead of north and south. Again, had Williams used different phrases to get the same message across, then his speech wouldn’t have been as jarring to people. My problem isn’t so much with Williams’ poor choice of words but with his actual bounty program. Players get paid enough money to go out and inflict pain on one another – it’s unnecessary and almost cruel for a coach to be offering monetary motivation to target their opponents’ specific injuries. It’s ridiculous to pony up extra cash in order to motivate a grown man in the best shape of his life to go onto a field with the sole purpose of targeting an opponents’ knee or head. That’s not football. That’s not sport. That’s not playing for the love of the game or in the spirit of competition. That’s just inhumane. That’s when I feel for Kyle Williams, Michael Crabtree and the rest of Gregg Williams’ bounty program victims. That’s where I draw the line and say, hey, what’s going on here isn’t right. Could Williams not have delivered such an unsettling speech? Sure, but that’s simply a matter of semantics. Outside of the specific comments about Williams’ head or Crabtree’s ACL, it’s not Williams’ words that are so much the problem, but the manner in which he tried to execute them. 1. Will Flacco raise his game to match Brady’s? One of the bigger mismatches this weekend lies within the quarterback matchup in the AFC Championship Game. While Tom Brady is coming off a six-touchdown, 363-yard passing performance against the Broncos, Joe Flacco put together a rather uninspiring performance versus the Texans last Sunday. In fact, Flacco has been rather inconsistent all season. He’s completing just 57.6-percent of his passes for an average of 6.66 yards per attempt, and has thrown 20 touchdown passes to 12 interceptions. He’s also fumbled nine times on the year and finished the regular season with a quarterback rating of just 80.9. Flacco took five sacks in that win over Houston and while New England doesn’t have the pass rush that the Texans do, the Pats did sack Tim Tebow five times last weekend. Their run defense is also capable of containing Ray Rice so if Flacco doesn’t elevate his play then the Ravens may once again fall short of their Super Bowl expectations. We know that Brady is going to elevate his game, especially with another Super Bowl within reach. But Baltimore needs to see more of the Flacco from the fourth quarter in that Week 9 victory over the Steelers and less of the lackluster signal caller from last week. 2. Can Smith build on his big fourth-quarter last week? You have to give Jim Harabugh’s staff a ton of credit for how they attacked the Saints last week. Instead of being timid and conservative like the Falcons were against the Giants, they knew they had to open things up if they were going to pull off an upset (which they obviously did). That said, Alex Smith’s overall performance was a little misleading. While he did throw for 299 yards and three touchdowns, the Niners’ first four scoring drives went for just 54, four, six and three yards because of Saints turnovers. It wasn’t until late in the fourth quarter when Smith decided to channel his inner Steve Young and deliver a handful of excellent passes, most of which found the hands of tight end Vernon Davis. If the Niners are going to repeat that success, Smith will have to build upon his fourth quarter performance from last week. He proved this year that he can be more than just a “game manager” but if the Giants bottle up Frank Gore and force Smith to beat them through the air, can he deliver again? 3. Can the Giants get the best of the Niners’ stout defense? Actually, they already have. Even though the outcome was a loss, the Giants racked up 395 yards of total offense against the 49ers in Week 10. It was the fourth-highest total any team has posted against San Francisco all season. The Giants, who finished dead last in rushing offense this season, also ran the ball effectively against the Niners that day. New York finished with 93 rushing yards (the fourth-highest total against San Francisco this season) and that came without Ahmad Bradshaw, who sat out with a foot injury. One of the many reasons the Giants have looked so dominant thus far this postseason is because their power running game has finally awoken. They bulldozed their way to 172 rushing yards versus Atlanta in the opening round and while they failed to crack the century mark against Green Bay last week, the Giants were able to put the Packers away in the fourth quarter with a couple of great cutback runs by Bradshaw and Brandon Jacobs. The 49ers don’t have many weaknesses defensively. They may have allowed 32 points last week against the Saints but anyone who watched that game knows that San Francisco’s defense played well until the fourth quarter. That said, there’s no doubt the Giants have the weapons offensively to take the Niners down. It’s just a matter of if Eli Manning can avoid turnovers and costly mistakes. 4. Can the Ravens pressure Brady from their interior? This question could be flipped as well: Can the Patriots block the interior of Baltimore’s defensive line? One of the many things the Broncos failed to do last Saturday night (besides, you know, showing up) was generate pressure with the interior of their defensive line. The Patriots got into their up-tempo offense and before you knew it they were up 35-7 at halftime. Brady had way too much time to stand in the pocket and survey the field. But the Ravens bring more to the table defensively, specifically tackle Haloti Ngata. He’s someone that could definitely become a concern for Brady if his offensive line can’t get him blocked. Just like any elite quarterback, the key to beating Brady is to generate pressure with only your front four and commit more defenders to coverage. Obviously the Ravens still need to blitz from time to time, but teams that solely use blitzes as a way to create pressure will often get burned in the end by guys like Brady, Aaron Rodgers and Drew Brees. Considering the Jets beat the Patriots in the playoffs last season by constantly providing pressure, this Baltimore-New England game will likely be won or lost in the trenches. 5. How will injuries affect this weekend’s games? Sorry for leaving this question open-ended but this is something that won’t be answered until after the games have been played. Gore suffered a right leg injury on the 49ers’ final drive last Saturday but says he’s fine. John Harbaugh says Ed Reed will be “all right” for the AFC Championship Game but the safety needed assistance getting off the field last Sunday after suffering an ankle injury late in the fourth quarter. Giants’ defensive tackle Chris Canty said he’s 100-percent after suffering a fourth-quarter knee injury but he was down for quite a while last Sunday in Green Bay. Victor Cruz also suffered a leg injury against the Packers after taking a helmet to the thigh. Nobody should expect these players to miss the conference championship games but all of these injuries could have a huge factor on this weekend’s matches. We’ll just have to wait and see whether or not any of these injuries will have an impact on the four teams’ Super Bowl chances.